A day after West Bengal Chief Minister Mamata Banerjee’s claim, it is now turn of the Assam Congress to make similar allegation that the CBI stopped probe into Saradha scam in Assam after state minister Himanta Biswa Sarma joined the BJP. “They are trying to cover up the scam in Assam,” added Bordoloi. 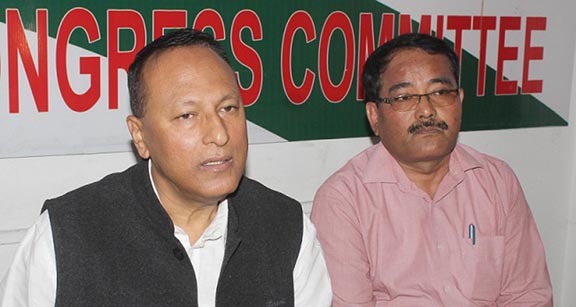 While claiming that the Saradha chit fund scam happened in Assam at the initiative of Himanta Biswa Sarma, APCC vice-president Bordoloi also mentioned about the incident of committing suicide by Assam’s former DGP Shankar Barua in connection with the scam. “Even after such incidents in Assam, the CBI has remained silent,” said Bordoloi. After that, Sarma and his wife were also questioned by CBI sleuths in Kolkata. “But surprisingly, as soon as Himanta Biswa Sarma joined the BJP, the CBI probe stopped in Assam,” claimed Bordoloi. Besides, Bordloi also alleged the CBI has delayed the probe into the Louis Berger bribery case in Assam. Stating that a minister in Goa was arrested and his property seized for being involved in the Louis Berger bribery case, Bordoloi mentioned that the CBI has taken no action against Himanta Biswa Sarma. Bordoloi also said in a booklet titled ‘Saga of Scams in Congress-ruled States’ released by the BJP when Himanta was a Congress minister, the saffron party had termed Sarma as ‘key suspect’ in the Guwahati water supply scam involving Louis Berger.